40 Prayers of Victory! This is truly an exceptional and spirit-filled, loaded weapon for every Believer to have. A "must have". No prayer library will be complete without it. 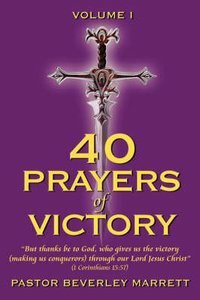 40 Prayers of Victory presents prayers that deals with every day struggles and challenges such as worry, fear, anger, generational pain, but by consistent application of the Word of God by faith you can make significant changes for victory in every area of your life. It is said that Prayer is our vital breath, food and sustenance, without which we are as light as a feather and easily tossed to and fro by every wind. But I can assure you that armed with these Prayers 'one' is able to put a thousand demons to flight easily. As I read through these prayers, it felt like firing a well loaded rifle, bullet after bullet, hitting its target with accurate precision, until the gun is emptied. The last prayer then reloads ready to start all over again. Praise the Lord for Victory in the Name of Jesus! About "40 Prayers of Victory (Vol 1)"